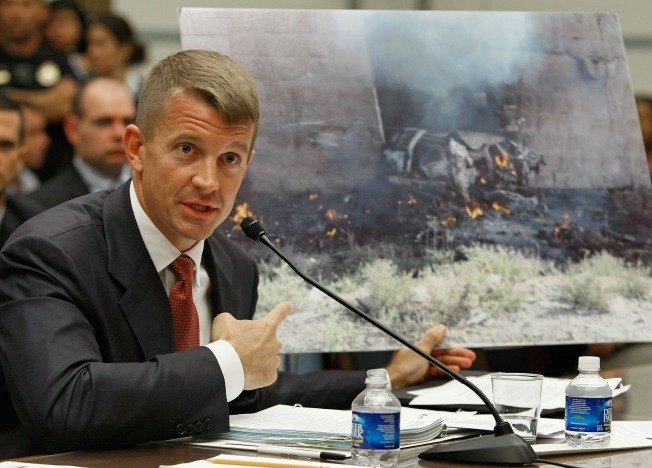 Blackwater CEO Erik Prince, here testifying to Congress in 2007, has failed to convince prosecutors that his people were ambushed ahead of a shooting that left 17 Iraqis dead. Five mercenaries sent to Iraq by the U.S. government to provide security have been indicted for their part in a 2007 shooting that left 17 Iraqis dead, while a sixth is negotiating a plea deal. The six guards from the private security firm Blackwater Worldwide have been under investigation since Sept. 16, 2007, when a convoy they were a part of opened fire on a crowded intersection in Baghdad. Witnesses claimed that the shooting was unprovoked, but Blackwater claims its people were ambushed while responding to a car bombing. The exact charges in the indictment, which was obtained late Thursday and remains sealed, are unclear. The Justice Department has been considering manslaughter and assault charges against the guards for weeks. Sources spoke on the condition of anonymity as the indictment may not be opened until Monday. Prosecutors have also been considering bringing charges under a law, passed as part of a 1988 drug bill, which carries a mandatory 30-year prison sentence for using a machine gun in a crime of violence. Regardless of the charges they bring, prosecutors will have a tough fight. The law is unclear on whether contractors can be charged in the U.S., or anywhere, for crimes committed overseas. The indictment sends the message that the Justice Department believes contractors do not operate with legal impunity in war zones.